This soup is a symbol of what can be made of something that previously did not exist. Last year, there was very little to eat in winter for those in search of local fare. 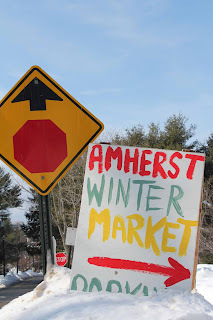 This year, four winter Farmers' Markets, three of them weekly. Designed to draw attention and draw a crowd, a lunch of local, organic winter fare was served in a middle school cafeteria in Amherst in January of this year. Growers, eaters and supporters broke bread and made brief proclamations of joy. It is no small feat bringing local food out in winter and selling it. The ingredients for this Stone Soup are as follows. Much of it can be found at winter farmers' markets in Northampton, Amherst, Greenfield and Springfield. Preheat the oven to 400°. In a large nonreactive skillet, melt 1 tablespoon of the butter in 1 tablespoon of the oil over moderately high heat. Add the onion and carrots and cook, stirring occasionally, until browned all over, about 10 minutes; transfer to a large roasting pan. Add another tablespoon each of butter and oil to the skillet. Add the celery root and butternut squash, and cook, stirring occasionally, until browned all over, about 10 minutes; transfer to the roasting pan. Repeat the cooking process using another tablespoon each of butter and oil and the acorn squash and parsnips. Add the remaining tablespoon each of butter and oil. Add the Portobellos and cook, stirring occasionally, until tender and browned all over, about 6 minutes; transfer to the roasting pan and stir to mix. Add the Mushroom Broth to the skillet and bring to a simmer over high heat, scraping up any browned bits. Pour the broth over the vegetables. Season with salt and pepper and add the marjoram. Cover with foil and cook the vegetables in the oven for about 45 minutes, or until just tender when pierced. Increase the oven temperature to 450° and cook, uncovered, for 5 minutes longer. Meanwhile, make the Cheddar biscuit crust: In a medium bowl, stir together the flour, baking powder, garlic, salt and pepper. Using a pastry cutter or 2 knives, cut in the butter until the mixture resembles coarse meal. Stir in the cheese. Add the cream and mix lightly with a wooden spoon until the dough just holds together. Cover and set aside. Using a large spoon, dollop the biscuit dough on the vegetable stew; there will be some bald spots. Bake for about 20 minutes, or until the crust is cooked through and golden. In a pinch, use chicken stock or canned low-sodium broth.